Mike from the Virtual Reality Oasis YouTube channel traveled to London to find out more about the Feel Three Virtual Reality Motion Simulator which is being developed by Mark Towner. 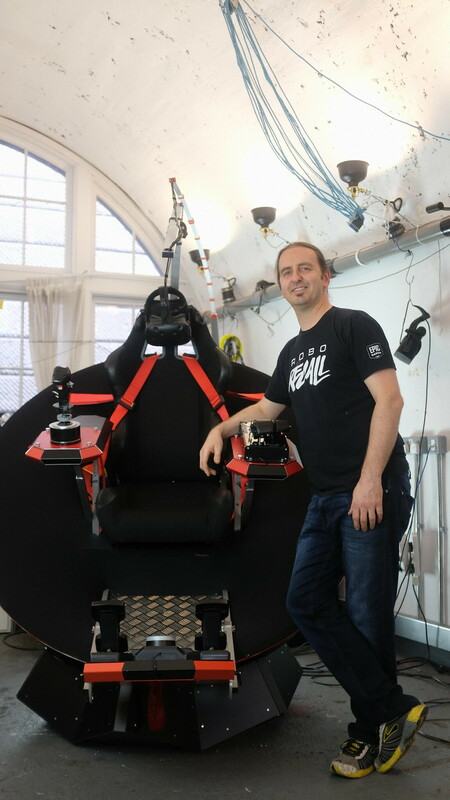 With the Feel Three project, Mark aimed to develop an affordable, modular and customizable motion simulator specifically made for use with VR equipment. While most current motion simulator platforms only feature a small range of motion, the Feel Three Virtual Reality Motion Sim is a major step up, as it sports an incredible 100 degrees of pitch and roll. The simulator is a half sphere which sits in a base containing wheels and motors to move the user in three degrees of rotation: pitch, roll, and yaw. Because the center of gravity is at the center of the sphere there is no lifting, and the simulator is very easy to move. Needless to say that this product in development can also be of interest to sim racing enthusiasts. Mike boarded the simulator for a demo and drive using Project Cars and an HTC Vive VR headset. After an exciting test session, he sat down with Feel Three founder Mark Towner to talk about the Kickstarter opportunities, the simulators development cycle, and its future. adjustable and users can quickly swap their joysticks and wheels to switch between different game types. The Feel Three is a new dawn for affordable VR simulation games. and even flying a broom. We’re looking forward to seeing what developers come up with, but in the meantime, you’ll be able to play hundreds of currently supported titles in pure VR, or classic mode for non-VR titles. FeelThree is based in London at the co-working space, Makerversity in the basement of Somerset House, and will be holding regular demos to allow backers and press to see and try the simulator during and after the Kickstarter campaign.